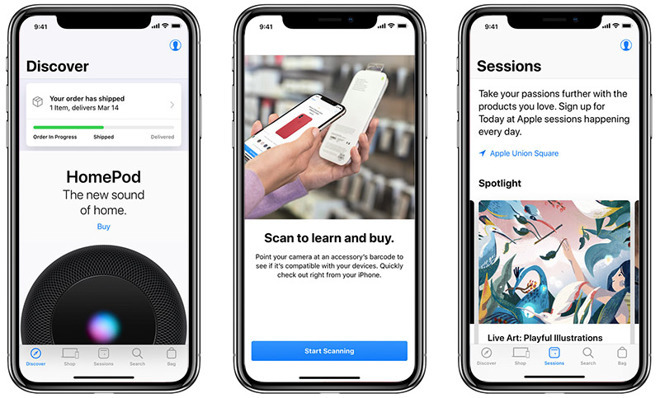 Apple Store version 5.0 delivers a refreshed user experience with better in-store integrations, new Sessions and Search tabs, expanded shopping features and a redesigned user interface. Most notable is a dedicated Sessions section that throws a spotlight on nearby Today at Apple educational sessions and special events. Apple is doubling down on Today at Apple, with activities now included in both the Discover and Sessions tabs. A Spotlight card interface allows users to flip through upcoming sessions in both tabs, while a Signature Programs bar provides information about Apple's educational offerings like Photo Walks and Teacher Tuesdays. The Sessions tab incorporates a more in-depth look at upcoming presentations, including a comprehensive list of forthcoming sessions arranged by time and location. Users can tap on an event for a breakdown of the class, an option to sign up, directions to the host Apple store and more. Apple also allows users to browse upcoming sessions by date and category, from Art & Design to Business to Product-specific tutorials. Also new is a dedicated Search tab for finding additional information on products and store locations. An automated nearby store finder is also included in this section. As for in-store improvements, the app includes a feature that lets customers scan and buy accessories directly from their iPhone. Other changes include new options to view invoices, edit shipping details and engraving messages or cancel items from an order. Previously, customers looking to make modifications to orders would have to do so from Apple's web interface. Finally, the revamped app includes information about "Certified Refurbished" models at the bottom of applicable product pages. The Apple Store app is a free 68.2MB download from the iOS App Store.